Critical thinking enhances learning because it lifts the class from the lowest and most basic levels of intellectual activity to higher, more complex mental structures. But the ability to reach those levels does not appear all at once. The teacher must guide the students through strategic questioning and other methods to help the student build a sound support system of thinking. To some, the student appears to be climbing a mental scaffold, placing their limbs on a higher level of complexity one by one. This process of offering successive approximations of thought during class activities is called scaffolding. The teacher provides increasingly challenging mental tasks through carefully constructed questions, age-appropriate tasks such as responding to writing prompts or quizzes, and discussions that bring the student to accurate and in-depth conclusions. Students who are exposed to these methods will become more adept at them as time progresses. Students will begin to develop "habits of mind" that foster critical thinking in the form of analytical thought, creative solutions to problems, and innovative ways at approaching complex tasks. Students who develop their cognitive skills will experience corresponding growth in the affective domains of learning. In other words, students who become accomplished critical thinkers begin to build self-confidence and start to enjoy the process of learning complex concepts. so that the student moves beyond the basics of a given area of learning into a scientific and empirical mode of thinking. All too often, the teacher presents a slate of unrelated concepts in the form of bits of data. Students invariably attempt to master these floating data usually demonstrated by way of a multiple choice test. Students and teachers engaging in this process of fragmentation are not asked to move beyond the first or second level of Bloom's hierarchy of learning, and consequently, much of the data is lost after it has been assessed. Real learning takes place when connections are made between topics within a subject, and by extension, between subjects in the form of interdisciplinary units of learning. Otherwise, teachers force their students into a sort of balkanization of knowledge. Unless students use it (their thinking), they will lose it (their understanding). Critical thinkers, on the other hand, in the form of both teachers as models and students as protégées, understand that each discipline of learning is an interrelated system of knowledge. Moreover, teachers who ask their students to write in complex, extended responses, who challenge them to create visual and tangible products that are based on replicated data, move up Bloom's ladder, making learning more meaningful, longer-lasting, thereby contributing to the overall quality of a person's life. Teachers who ask their students to write in complex, extended responses, who challenge them to create visual and tangible products that are based on replicated data, move up Bloom's ladder, making learning more meaningful, longer-lasting, thereby contributing to the overall quality of a person's life. Students in Civics classes must take on the guise of a political scientist, whether it be in the form of college professors, media analysts, civil service workers, campaign managers, or public opinion pollsters. Teachers must make their students aware that Civics, like any academic discipline, is a mode of thinking or system of thought because it is made up of interrelated concepts rather than disconnected pieces of irrelevant information. have purpose: To understand how government works and what it means to be a good citizen. ask questions: How do governments work and what are the rights of citizens? gather data: in the form of public opinion polls, election results, economic trends, historical documents. offer conclusions and consequences: of human interaction in the form of democracy, freedom, authoritarianism, capitalism and other ideas that stem from human interaction. must be clear when communicating, relevant when discussing the issues, and fair to all groups involved in the discussion. Summary: Political scientists want to determine how major institutions work to protect human rights. These institutions include Congress, the Presidency, the Courts, the Media, Businesses, educators, and artists, among others. In whichever academic discipline you operate, have your students think like practitioners of that discipline. Also give them practical applications of your content field so they see there is relevance to it in the modern global economy. Using Inspiration Software, I have adopted the idea of a discipline as a system of thought and applied it to Civics. The core idea is at the center consisting of a definition of Civics. The first concentric circle represents concepts that are basic to the topic and that drive the curriculum as it would be taught in the classroom. The teacher would provide instruction that scaffolds these concepts first. Once students have not only mastered the definitions of each concept but also their relationships to each other, then the teacher can move up the hierarchy and introduce more complex and abstract ideas, as represented by the outer pink circle. It must be pointed out, though, that highly complex and abstract reasoning is a developmentally achieved skill. According to the well-known cognitive stage theorist, Jean Piaget, adolescents begin to master abstract thinking around age 14, give or take a few months. Students not yet adept at this more complex level of thinking have the ability to do so, but they may need more time, smaller conceptual chucks, and concrete examples to make the connections. (Check out Piaget's Theory of Cognitive Development for more information). Note that some of the concepts are in both regions of the diagram. Some concepts lie almost outside the second circle, making up a third outer circle of concepts. Knowledge is more fluid than can be captured on a diagram. 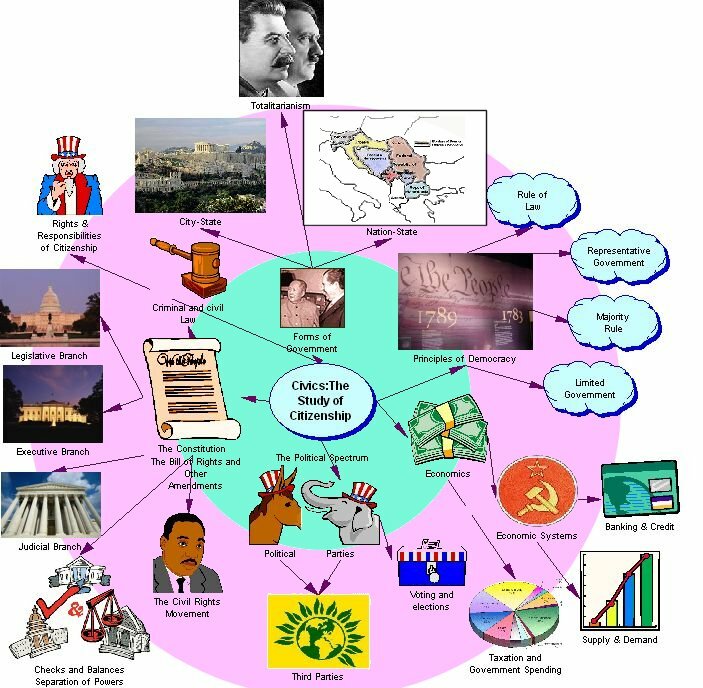 There are hidden relationships between these concepts that can be brought out in the form of class discussion, formal essays, class projects, and through application of these ideas to current events. Also, not all concepts found in the Civics curriculum could be shown here due to the space constraints of the computer screen or the printed page. But it would be a starting point for students of Civics or of teaching methods to consider. Although intellectual integrity is one of the specific intellectual virtues, I see it as the "gateway" virtue because striving toward integrity in thinking captures the essence of the whole paradigm. Integrity implies maintaining one's current thought structure free from impurities or corrupting influences. Instilling these virtues in our students is one goal inherent in teaching critical thinking skills. Critical thinking sometimes calls into question conventional wisdom, which may be the product of peer pressure or the media's insatiable desire for profit at the expense of the truth. We do our students a great service if we help them become questioners of the forces around them, not to make them cynical or skeptical of the world in which they live, but to find answers to the pressing issues of the day on their own. The intellectual virtues described above encourage students to become free-thinkers, unfettered by the established norms of the power-holders in our society. These virtues call for an honest evaluation of the information that is fed to our students from a variety of sources (including teachers). If your students are questioning what you tell them, then take heart in the fact that you are helping them develop their ability to think critically. They can do so with respect for each other and for the authority and level of accomplishment that you as the teacher bring to the classroom. As one sign in my classroom patiently admonishes my students to do: "question authority, but raise your hand first." If your students are questioning what you tell them, then take heart in the fact that you are developing their ability to think critically.